The Cape Elizabeth native says she is focused on rebuilding weakened programs in areas such as child protection, public health and rural mental health. Jeanne Lambrew, acting health and human services commissioner, breezed through a legislative confirmation hearing Thursday after telling lawmakers she plans to focus on bolstering public health and improving child protective services that “deteriorated” under the previous administration. Lambrew’s nomination will now go before the state Senate for a final vote, likely next week. The Health and Human Services Committee voted unanimously to endorse Gov. Janet Mill’s nomination of Lambrew. No one spoke against her getting the job. Lambrew, a Maine native who had previously worked as a high-ranking federal health official in the Obama and Clinton administrations, gave detailed policy answers on a number of topics, including plans to boost the Maine Center for Disease Control and Prevention, attack the opioid crisis and improve the child welfare system in the state. “I’m just being a nerd,” said Rep. Colleen Madigan, D-Waterville, after asking a question about how expanding Medicaid could affect the cost of private insurance. “I can nerd back,” Lambrew said in one of the lighter moments of the hearing. She then said that expanding Medicaid creates downward pressure on private insurance costs, partly because it reduces demand for charity care at hospitals. Lambrew said one of her top goals in heading up the Maine Department of Health and Human Services will be to fill vacant positions at the Maine CDC and “take a good hard look” at what it does. Jeanne Lambrew, Gov. 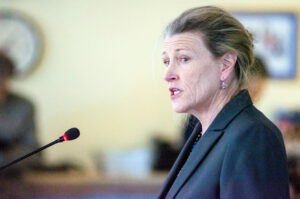 Janet Mills’ nominee for health and human services commissioner, told lawmakers Thursday that she plans to focus on improving child protective services that “deteriorated” under the LePage administration. As a federal official, Lambrew helped implement the two largest expansions of health care in the United States since the 1960s, the Children’s Health Insurance Program during the Clinton administration and former President Obama’s signature domestic law, the Affordable Care Act. Lambrew said it’s not just the CDC, but many aspects of Maine DHHS that will be examined and overhauled, if necessary. The agency has a $3.4 billion budget and 3,400 employees. Under Gov. Paul LePage, Maine DHHS came under scrutiny over several issues, including the abuse-related deaths of two young girls in late 2017 and early 2018, decertification of Riverview Psychiatric Center for using stun guns on patients and other problems surrounding care, and the disarray that resulted when the MaineCare transportation system changed the way it delivered rides to medical appointments in 2013. The department has already shifted under the Mills administration, by expanding Medicaid on its first day, and rejecting work requirements for Medicaid recipients that were approved by the federal government in the waning days of the LePage administration. More than 2,000 have signed up for Medicaid of up to 70,000 Mainers likely to qualify under the expansion. Medicaid currently provides health insurance for about 250,000 residents. Lambrew, who grew up in Cape Elizabeth, is the daughter of Dr. Costas Lambrew, a former cardiologist at Maine Medical Center. Her mother, Pat Lambrew, is a nurse who helped create high school CPR programs.